Oh my stars!!! This recipe is from Rachael Ray and is the BEST soup I've ever had!!! Make sure and follow her directions and DEFINITELY use smoked mozzarella- it is WELL worth it!!! That sounds so good!! Thanks for sharing that recipe! Yumm-o! This looks great! I am a huge Rachael Ray fan. OH MY GOD! That sounds sooo yummy. I have to make it. Oh my goodness, this is definitely going on next week's menu. That sounds delicious!! !I love Mexican style soups! Thanks for the recipe! This soup sounds so yummy! Tortilla soup is one of my favorites and this looks like an interesting variation. This looks great, packed with so many tasty flavours - yum! 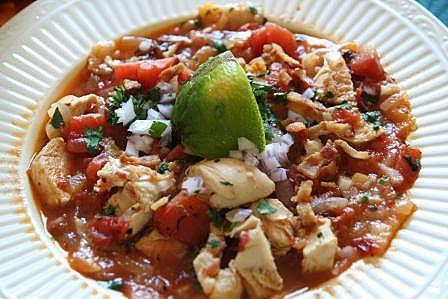 Oh man this looks so great :) I love chicken tortilla soup! I've never had smoked mozzarella! I'm not sure I can even BUY it up here but it sounds tasty! Thanks for linking up to the friday frenzy! This is my kind of soup - so filling and flavorful! Your soup will be delicious! Hope you had a wonderful weekend and thanks so much for sharing your special post with us at Full Plate Thursday! Have a great week and come back soon! This looks so good! Thank you for sharing at the Friday at the Fire Station link up! I can't wait to try it!